Nov. 20. By Dave Vieser. The days are numbered for that 11-acre stand of pine trees between Knox Road and West Catawba. In a 4-1 decision, the Cornelius Town Board approved the rezoning of prime commercial land Monday evening to allow the construction of retail and office buildings. The approval followed a two-hour public hearing where residents voiced their opposition to the project. Charter Cornelius LP plans to build five commercial buildings totaling over 40,000 square feet at the northeast corner of West Catawba and One Norman Boulevard. Charter is a New England based corporation which has successfully built a number of retail shopping centers through the East. The proposed commercial uses include a Chick-fil-A restaurant with drive-through, a grocery store, an ice cream custard facility and potentially a bank. The town and developer had negotiated a 17 point agreement which outlined a number of steps which would need to be done for the project to proceed, including traffic remediation measures outlined by the state DOT and a traffic impact analysis. 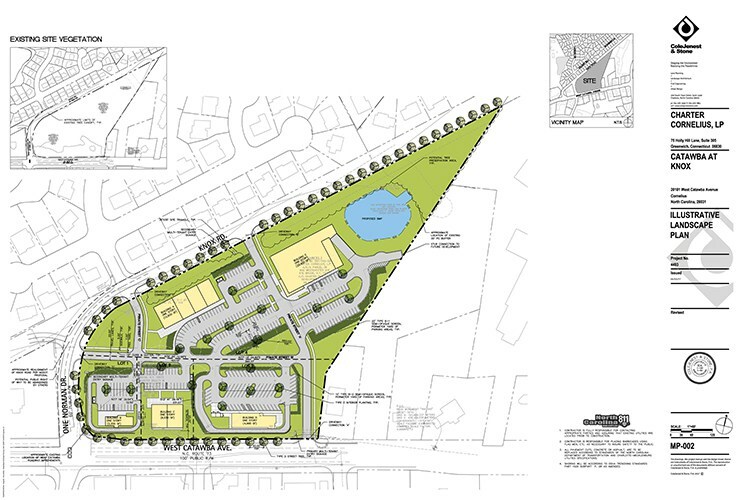 However, residents living nearby in the Blue Stone Harbor development still took exception. “I appreciate the work you and the developer have put in, but it just isn’t good enough” said resident Phil Davis. “We’re not against economic development, but this is the wrong location.” Davis and his fellow neighbors expressed deep concern over the safety of the families, and especially the children, who might be impacted by additional traffic generated by the development. Commissioner Kurt Naas concurred with the sentiments of Davis and his neighbors. “The negotiation process between the town and developer has been exemplary but this is just not the right location,” he said. Naas proceeded to vote against the project. Mayor Pro Tem Mike Miltich initially said he was “conflicted” by the project, but ultimately voted in favor along with the remainder of the town board. In other action, the town board also approved rezoning to permit the development of approximately nine acres on the east side of Catawba Avenue near the Nantz Road intersection. The site is currently vacant except for two homes being used for commercial purposes. A 7-Eleven will be located just south of the Nantz Road intersection, and Nantz Road will be extended to the south and east. The convenience store near the entrance to Magnolia Estates will be permanently closed. This store has always been technically listed as a 7-Eleven, but has never been fully branded as such due, in part, to a lack of space at that site. As with the Knox Road Project, coordination with the NCDOT will be a requirement. especially in view of the widening project expected to begin in 2020. In addition, the town will hold the issuance of a Certificate of Occupancy (CO) for the retail building in the rear to properly phase with the widening work. Approved a supplemental agreement with the Southeastern Power Administration which will bring an additional 100 kilowatts of Federal hydroelectric power into Cornelius for Electricities customers. This additional allocation of 100 kW provides for $1,281 in savings per year. Recognized David and Diana Rochester for their ten years of volunteer service to the town. During that time, they have volunteered thousands of hours for many events and tasks inside the Police Department. They have been chosen by the town to be the Grand Marshals for the 2018 North Mecklenburg Christmas Parade to be held on Dec. 1.
body of Lake Norman by the I-77 causeway. The proposed access area is part of the 2015 Federal Energy Regulatory Commission relicensing process.